The Norfolk-based carrier Dwight D. Eisenhower is deep into the basic phase of pre-deployment training while underway in the Atlantic. 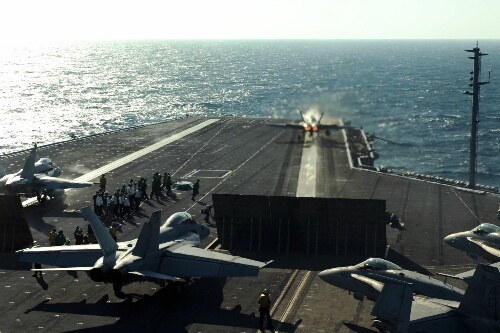 Technically, it’s taking part in a Tailored Ship’s Training Availability and Final Evaluation Problem, or TSTA/FEP, and conducting carrier qualifications for Carrier Air Wing 7 fliers. Ike will be out for several weeks to come, so it’s a busy time for the crews of the ship and the wing. All that activity demands fresh stores of all sorts. 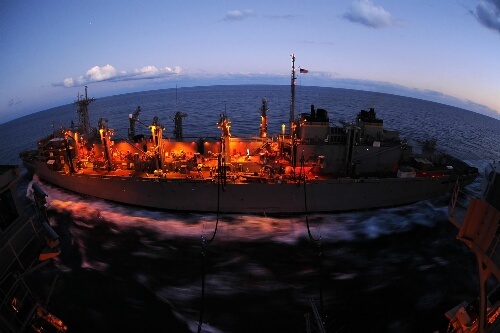 On Oct. 18 — not clear if it was pre-sunrise or post-sunset — the fast combat support ship USNS Arctic delivered the goods. 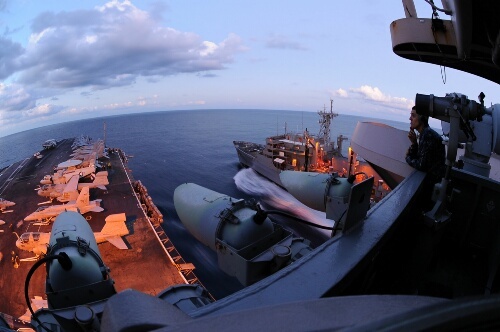 During an UNREP, the flight deck remains quiet — but under a watchstander’s careful eye.